I may actually be getting vaguely excited about my impending trip. About bloody time as we fly out in 3 days. Though I usually say I don’t start to relax until I’m on the plane. We’re traveling for 6 weeks and have booked 10 nights of accommodation so far, or roughly a third. Sometimes I’m comfy with that, sometimes I’m not. I am comfortable with the flexibility. We kept looking stuff up on wotif and being disappointed with the results. There’s 3 of us traveling: moi, my partner and Ms16. Wotif doesn’t show many places and keeps returning places with 1 bed + crib. A crib is no good. Airbnb however is showing lots of apartments, many of which are suitable ie 2 rooms with 2 beds. We’ve booked one place with wotif and 2 places with airbnb so far. We have booked accommodation over christmas thankfully as that’s likely to be a hard time to book. Flexibility means that this week we were able to throw in a weekend in London in January and see a show or two. We have booked the shows and the Paris-London-Paris eurostar (around 2 hours 15 min each way). We will be seeing Matilda together and the other 2 will also be seeing Wicked. I saw Wicked in Sydney so I’m going to hang in London that day. I’m a wee bit excited about going to London again which is a bit weird. I have spent more time in London than anywhere else outside Oz altogether, and house-sat occasionally. I immediately thought of a whole bunch of things I want to do and figured I needed a week minimum, however we’ll stick to the weekend. I will try to get Harrod’s as their food hall is the only place I’ve ever been able to buy Valrhona chocolate covered orange peels and they are my favourite. I’d also like to go to Kensington Gardens and see the Peter Pan statue in the snow. I usually like to pay my respects to Peter each time I visit London. I also want to go to my favourite museum, the John Soane Museum. Heading off in a week or so for a 6 week holiday in Europe. I am alternately between sheer panic and totally chilled. Flights are booked, a couple of trains are booked, accommodation for first place and for christmas have been booked. I’m mostly ok with that, on the other hand I panic occasionally as there’s 3 of us travelling together and I’m not used to travelling with other people. This time it’s with my partner and Ms15. Starting in Copenhagen and mostly spending time in Germany (for traditional christmas markets) and France, finishing off with a few days in Barcelona. Been a busy year and it’s been hard to plan or think things through. The last time I did a big trip was 3 weeks around Borneo in 2012 with Intrepid so everything was taken care of. My previous trips to Europe have usually been self guided and self propelled, on occasion finding accommodation on the fly. With that said, tech has improved a lot and I’ll probably get a local sim for my phone with data so I can carry on as usual. I doubt I’ll need rely as heavily on local internet cafes as I used to in the old days. I had mostly decided not to take my laptop which surprised my partner. However I’ve been rethinking this week that it would be handy to have with me, particularly if we’re weighing up options throughout the trip. Phone and tablets can handle some things but they’re not great for having lots of tabs open.The other advantage of the laptop is that I can use it to back up our photos as we go. I’m toying with the idea of making my NAS remotely accessible and backing up the photos to it as well. That might be overkill and create more headaches. I’ve never owned a sat-nav. I have on occasion, used google maps on the phone. Going to a new place I may check google maps at home to get a sense of where a place is. In olden days, I’d rely on on a printed street directory, I still have one in the car. But turn by turn driving, with computer voiceover, no thanks. When driving I like a broad sense of where I’m going and then I generally fudge a bit when in the right-ish vicinity. Sometimes in moments of desperation I will get the phone out and find out where the bloody hell I am. This approach is not particularly efficient, a little bit lazy, and a little bit stubborn. I reflect on this occasionally when playing video games, or should I call them computer games, though both terms sound a little archaic. Grand Theft Auto for example does a fullish sat-nav thang wih a coloured line from your car to your destination that recalculates if you take a different course. However I think the Skyrim approach works best for me. It puts a spot on the Skyrim map where I’m heading and I can see a rough idea of the terrain between it and me with a sense of where the major route may lie. That’s about it. I journey toward that point, not quite directly. Diversions occur, weird paths cross my own and beg to be followed. I head off on detours, all the while keeping in mind where I’m ultimately heading. Travel for me, in gaming and in life, is rarely about getting from point A to point B. Looking at my last attempt at creating a bucket list, I can see that I’ve still done none of the stuff listed, yet I have done other stuff. I remain and continue to be happy. With that said, I have recently checked off something of a bucket item. It’s long been a regret that though I’ve travelled well outside Oz, I hadn’t managed to travel the breadth of Oz itself. Of those, I can finally tick off number 2. With my recent Tasmanian trip I have finally been to all Oz states and territories. Not to mention all capitals. Ultimately, as with all checkboxes, it’s a thing to brag about but doesn’t really have a meaning of itself. Rather, it functions as a reminder of how much more there is to do and see. I’ve been to NZ many times and still feel like I’ve barely scratched the surface. I have now “been” to Tasmania but hope I have many trips ahead. As always, there remains many, many things that I want to do and places to go. A few weeks ago we popped down to Tassie for a long weekend and amongst other things we, or mostly I, tasted quite a few whiskies and spent evenings in the Nant bar and the Lark bar. We actually visited the Lark bar a couple of times as it had a really good atmosphere and had many Tassie whiskies available as well as Lark, whereas Nant only had Nant from Tassie plus a good range of international whiskies. The Sullivan’s Cove was definitely my favourite, however the Overeem was a close second. Alas, or luckily, the Sullivan’s Cove was not available for sale as it’s really expensive these days. The guy did however give me the empty box as they had about 20 empty boxes out the back. I don’t recall being particularly fond of the Trapper’s but really liked the Mackay’s. 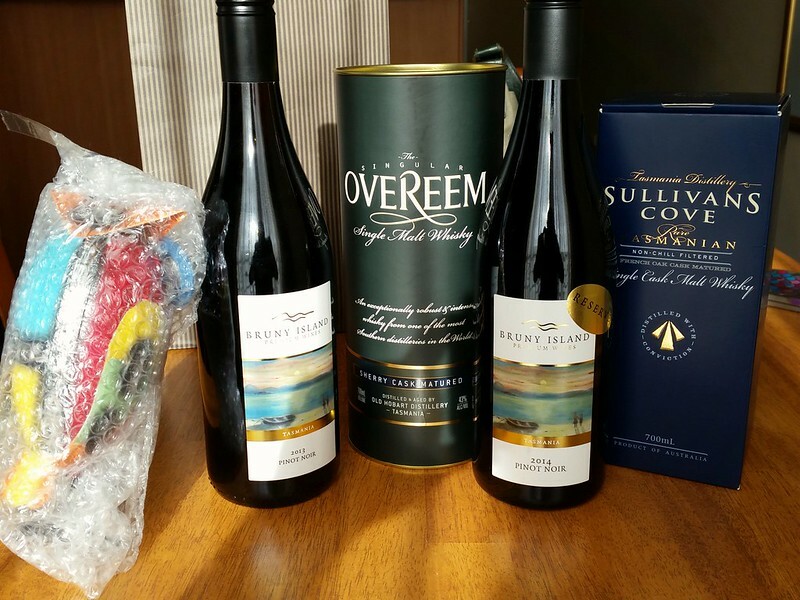 As part of the Bruny Island trip, we had lunch and tastings at the Bruny Island winery and they make some rather yummy pinot noir so I picked up a bottle of their standard and their reserve. The final item in the picture is a colourful owl I picked up at the Salamanca markets. The travel shelf: places I’ve been, places I almost visited and places I’d like to go. My very first trip out of the country was in 1999 and I spent 4 months backpacking, starting with a christian music festival in the US, and continuing to the UK and Europe. On that first trip, I met many people I’d previously only known online via usenet, through groups such as rec.music.christian, alt.fan.pratchett and alt.fan.wednesday – including Wednesday herself. I remember my Lonely Planet for “Western Europe” had a misprint on the spine and was spelt “Westen Europe”. I regret not keeping it. To reduce weight, I ripped out the sections I wasn’t using and ultimately tossed the whole, broken mass before heading home. Anything to reduce weight. Ultimately I returned from that trip having bought too many books, too many clothes and over 50 CDs. A year later I returned to Europe for a 5 week trip with friends. I’ve made it to Greece 3 times, Italy a few times, a wonderful trip to China. With a mix of earlier jobs and regular travel, I think I managed to make it to London 5 years in a row, with good memories of Scotland and Ireland; Central Europe and particularly Prague, and of course France. Nor can I forget travelling with dad and my sister around France and Belgium. I recall in Bordeaux, we bought a very nice red on a winery tour and decided to picnic in a park back in town. We went to the supermarket to buy some cheeses and glasses and dad wanted to buy plastic glasses, however I insisted on glass glasses. A good wine tastes much better out of glass I reckon. To my shame, I didn’t make it to New Zealand until my job at the time required me to do so. Consequently, mostly for work, I went back a couple of times a year over several years and attached holidays here and there. I fell in love with the place and was in the midst of planning a move to Wellington when the job at the State Library of NSW popped up. Iceland: I still haven’t made it. I had plans to go several years ago, on two separate occasions. No luck so far. I’ve been to all States and Territories of Australia but still haven’t made it to Tasmania. I’ve been to Canada and had good times in Toronto. 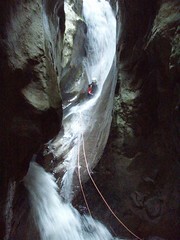 Two of my trips to Greece were to attend international rendezvous for canyoning, both times were amazing, once to Crete and once near Lamia in Northern Greece. 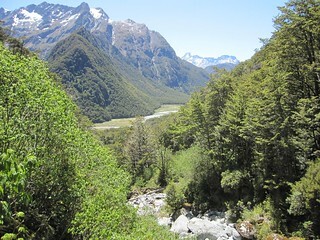 My last trip to New Zealand was mix of work (attending LIANZA) and a 3 day hike on the Routeburn track. My last big trip was two years ago, when I spent a month travelling through Borneo with a mate. Antarctica remains a desire, as does a return to Scotland. One day, I would love to hike The Pennine Way in the UK..all 18 days or so of it. Following on from flexnib’s example, I’m going to attempt doing an A to Z of topics ie each post will be based on a word based on the current letter of the alphabet, starting with A and ending with Z. Con is doing it in 26 days as it seems to be an April challenge. I’ll give that a go, but mostly I’m just aiming for 26 posts. I last blogged nearly 4 months ago, and I have not been active in the blogosphere in the time since. My online activities have waned. To some extent, I suspect that’s a side effect of the death of my mother at the end of December…no sympathy required and I’m doing ok; her passing was not unanticipated. I’ll cover another side effect when I hit “B”. On the other hand, I have picked up on physical things. I am walking more. I even did a 3 hour walk around Northbridge on the weekend. That’s not a particularly big deal, however I’m aware that my fitness has lagged and I’ve not really been up for the sort of tramping I did for Routeburn in December 2010. I’d like to get back to that level of fitness so I can return to New Zealand and explore more of their Great Trails.